Wansfell is the nearest fell to Ambleside and can be reached along a clear but somewhat steep path right from the town centre. I find the eastern slopes of Wansfell remind me of the Dales, with a feel of the limestone country about it, especially on the slopes around Nanny Lane coming up from Troutbeck village or the top of Hundreds Road, on the southern slopes, where the track crosses a stream and waterfall that wouldn't out of place around Ribblesdale. The western slopes and the long summit ridge are much more classic Lakes in character. The summit is one of my favourite viewpoints for Windermere, with the lake seen twisting and turning as it runs south, and the barrier of islands at Bowness seen to good advantage. 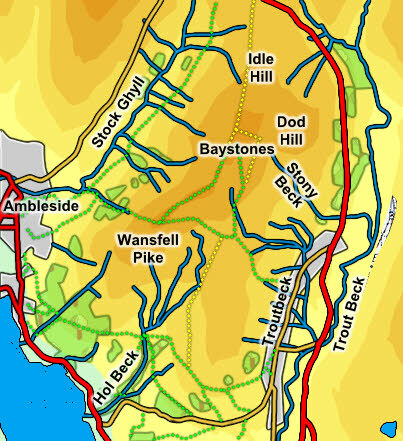 There are plenty of paths around the southern slopes of Wansfell, but three routes reach the summit. The most popular comes up from the west, and can be reached along two paths from Ambleside. The second path comes up from the east and can be reached from two directions - the most direct is to come up Nanny Lane from High Green in Troutbeck then leaves the lane at a sharp right corner and heads west to the summit. The second comes from Robin Lane, on the southern slopes. This leads to Hundreds Roads and then to a permissive footpath that runs north to join the summit path at a stile. The third path runs along the ridge, starting at Woundale Raise and following the wall line past Baystones and on to the summit. This is a great path, although does pass over quite a few smaller tops, making it quite undulating. We have an ascent of Wansfell from Troutbeck. The summit comes at the south-western end of the long ridge that tops the fell. It appears as a pike when seen from the western approaches, but as a rocky outcropping on the ridge when seen from other directions. A wall runs close to the top, which is on the western side of the wall. Wansfell has fairly clear boundaries. In the north it ends at Woundale Raise, where the A 592 crosses from Troutbeck to the Kirkstone Pass. Grove Gill flows west from Woundale Raise, forming the north-western boundary. It flows into Stock Ghyll, which flows south, forming the western boundary. Stocl Ghyll is the stream that flows through Ambleside, running into the River Rothay west of the town. The river then forms the final part of the western boundary, merging with the Brathay and running into Windermere. In the east a nameless beck flows from the Raise into Woundal Beck. This then flows into Trout Beck, and Trout Beck forms the entire eastern boundary of the fell, running into Windermere. The slopes of the fell are littered with nameless becks. A few have been given recorded names. In the south west Stencher Beck rises some way below the summit and runs through woods past Stagshaw Gardens to flow into Windermere. A little further to the east Hol Beck rises to the south of the summit and also flows south into the lake, draining quite a large bowl in the hills. Stony Beck runs down the north-eastern slopes, rising between Baystones and Dod Hill and running south-east to join Trout Beck just to the north of Town Head. Middlerigg Tarn sits on the lower slopes of the fell, just to the north-east of the visitor centre at Brockhole. The fell also has a sizable footing on Windermere. Stockghyll Force, on the eastern edge of Ambleside, is well worth a visit, and can be reached easily from the town centre.